This delicious treat is one my mom has been making for as long as I can remember. 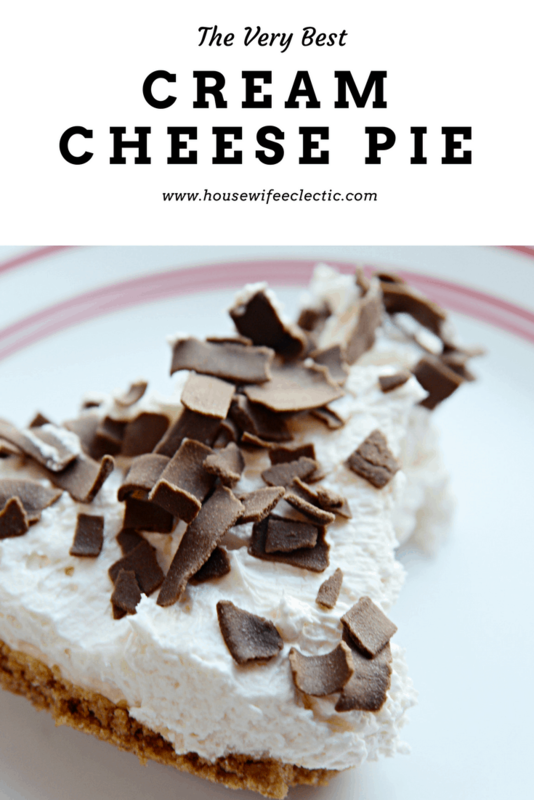 It is kind of like cheesecake, but it has a softer, more whipped cream type texture. My favorite thing about it is the chocolate shavings on top, made by using a vegetable peeler on the side of a thick chocolate bar. Yum! Preheat the oven to 375 degrees. Mix crust ingredients and pat evenly in a 9 inch pie or springform pan. Beat the filling ingredients with mixer until satiny. Pour into crust. Bake 20 minutes, then remove and cool for 15 minutes. Turn the oven up to 475 degrees. Blend topping ingredients and spread over cooled filling. 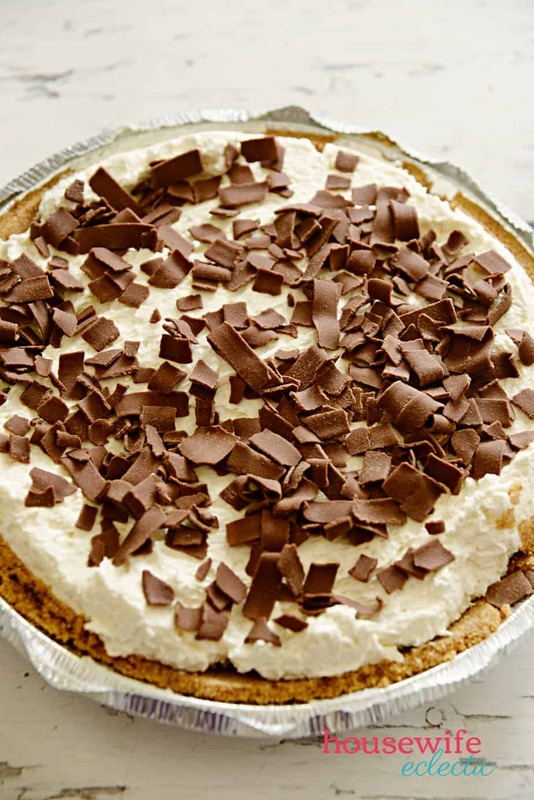 Return the pie to the over and bake 10 minutes longer. Cool until room temp and then chill in fridge. 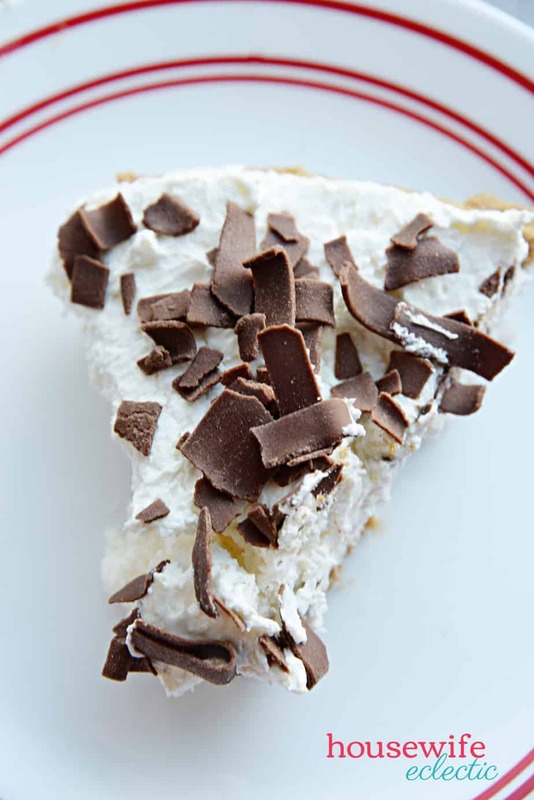 Before serving, take a thick chocolate bar and a vegetable peeler and slice curls off the edge of the bar to top the pie. This sounds a lot like my grandma's cheesecake — hers is whipped cream cheese and evaporated milk. Super fluffy. I grew up on that so it took me ages to get used to dense baked cheesecakes. Can you make it with fat free cream cheese and sour cream, to lower the calories? ?